On the evening of May 15, the U.S House Interior Appropriations Subcommittee met to advance legislation to fund our cultural agencies, including the National Endowment for the Arts (NEA) and the National Endowment for the Humanities (NEH). We have great news! Under the leadership of Chairman Ken Calvert (R-CA) and Ranking Member Betty McCollum (D-MN), both the NEA and the NEH are proposed at $155 million for FY 2019! This proposed $2 million increase matches the unified ask that Americans for the Arts and more than 85 national arts and arts education organizations made at Arts Advocacy Day in March! It also follows the record support from 166 members of Congress earlier this year in their request to the committee asking for at least $155 million for the agencies. The bipartisan letter was led by Congressional Arts Caucus co-Chairs Rep. Leonard Lance (R-NJ) and the late-Rep. Louise Slaughter (D-NY). 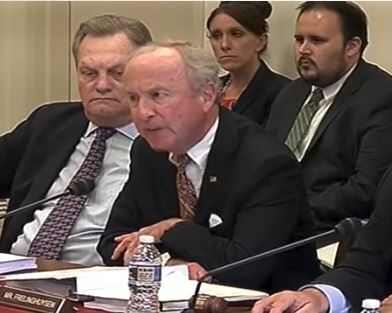 U.S. House Appropriations Committee Chairman Rodney Frelinghuysen notes the support both Endowments have in his home state during the subcommittee’s consideration of the FY 2019 funding proposal. Congratulations and thank you to the hundreds of thousands of arts advocates from across the country on your hard work and advocacy to get to this first congressional benchmark for FY 2019. Take two minutes now to urge your elected leaders to support this proposed funding increase. As you may recall, for the second year in a row, President Trump has proposed to terminate both these agencies in his annual budget request to the U.S. Congress, and the agencies still face opposition from some, which Chairman Frelinghuysen also acknowledged. Thank you for speaking out and letting your elected representatives know why federal arts support makes a difference in your communities, jobs, schools, and future. To see how various arts agencies and programs fared, check out the chart below. The full U.S. House Appropriations Committee will likely consider the bill next week, where amendments may be possible. The U.S. Senate is expected to consider the bill the week of June 11. Take two minutes now to urge your elected leaders to support the NEA!